For the 75th anniversary of its premiere?the story of how Casablanca was made and why it remains the most beloved of Hollywood films. 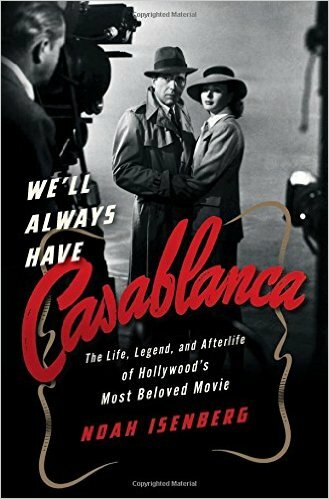 Isenberg gives us the soup-to-nuts on Casablanca, dutifully making his way through script, casting, production and reception, to the inevitable squabbling over credit, all the while trying to account for its enduring popularity ... Casablanca fans will find it to be a treasure trove of facts and anecdotes. We’ll Always Have Casablanca is less a history than a scrapbook: a digestible assembly of interesting facts, a few fresh quotes, ongoing controversies about who wrote which bits of dialogue, and tributes—from Simpsons parodies to Saturday Night Live sketches—meant to illustrate Casablanca’s lasting legacy. But as the 75th anniversary of Casablanca’s release arrives, Isenberg doesn’t seem to perceive the subtle but distinct transformation of the movie’s cachet over the past 10 or 15 years ... Certainly, Casablanca is a movie about political resistance, but it’s also a clarion call to cast aside isolationism and self-interest to fight on behalf of the invaded and oppressed. Although Isenberg doesn’t include interviews with conservative students who supported the Vietnam War, it’s not difficult to see how they might have interpreted the movie as an argument on behalf of their side. We’ll Always Have Casablanca, a lively new book by Noah Isenberg, approaches the film of its title with this historicizing method ... While devotees of the film will be delighted by the book’s collection of fun facts and accounts of behind-the-scenes drama, it also touches the raw nerve of this political moment. Watch closely, the book argues, and Casablanca will tell you how to live in our troubling time ... Basically, the tension between the hard realities reflected in the immigrant experience and Casablanca’s forced commitment to corny political principles are what made it great, at least in part, and what continue to draw new generations of cinephiles to it ... Combining trenchant analysis of the film’s poetic and political power with a well-researched and playful account of its legacy, We’ll Always Have Casablanca is a necessary book and perhaps even an urgent one. What did you think of We'll Always Have Casablanca: The Life, Legend, and Afterlife of Hollywood's Most Beloved Movie?